Written on July 30, 2008 by Kevin. I don't know exactly what started this but I first noticed it with Rylan a few months ago. He would just randomly grab a wipe and start cleaning our television stand. Maybe he felt bad that he had made it so dirty with fingerprints and what have you. Kaitlyn has now followed behind him and they both will grab a wipe and clean away. We are now using this to our advantage but not in a way to get out of chores ourselves. Rylan, and now Kaitlyn, find it fun to turn her glass bottles upside down causing the formula to drip out. Rylan has been known to drip an entire bottle dry, all over Kaitlyn before we noticed it. Rylan now gets to clean up the mess by using a wipe. This goes along with his normal naughty spot time that he gets. Kaitlyn turns the bottle upside down, gets a stiff warning and then sometimes does a bit of cleaning as well. Little do they know, they are learning something that they will simply hate in years to come. Professional shots at their finest.. Written on July 29, 2008 by Kevin. Written on July 28, 2008 by Kevin. We made the decision to begin Kaitlyn on her big bed over the weekend. I put together the bed on Friday night and when the kids came downstairs it was waiting for them to see. I explained to both of them that it was Kaitlyn's bed and they were both excited. Rylan was thrilled that Kaitlyn got to have her own bed now just like his. Kaitlyn just wanted a bed that didn't have walls. We planned this transition over the weekend in the case that she woke up all night, disoriented and decided to climb out of the bed. It worked well actually. She had a bit of a struggle that night falling asleep at first but this was mainly caused by Rylan throwing a fit of his own. This kept both of them up longer than necessary. The second night went much smoother though and they both went down pretty easily. She stays nicely on her bed until morning and then both of them play with their toy collection up stairs. Why did we move her out of her safe crib at this point? For a couple reasons actually. Rylan continued to hop in the crib and we had concerns that he may bring toys in which would allow her to climb and in turn fall out of the crib. She is a great climber so even without the toys, we figured this may be a possibility. Her new bed is just like Rylan's and its the perfect size and height for the two of them. They each have short walls to keep them from rolling out but still very accessible to Kaitlyn's short legs. Overall, it seems that Kaitlyn is going to transition into the big bed just as fast and well as Rylan did. We couldn't be more happy. Written on July 24, 2008 by Kevin. Kaitlyn continues to amaze us with her climbing skills. She attempts to tackle anything that gets in her way. We recently moved her crib a bit in their bedroom which caused us to move the small nightstand that was between them. We placed it on the other side of her crib which was close but not too close to a dresser. Last night she surprised us by climbing onto the night stand and making her way up the dresser. What was the reason? Her bows. Yes, my wife pulled her down and she immediately began pointing at her huge collection of bows and saying "Look it!". We love the fact that she really enjoys her bows but climbing on furniture is not the right way to show it. Written on July 21, 2008 by Kevin. Rylan has helped me in the kitchen a few times in the past and just recently my wife had him help her make a Peanut Butter and Jelly sandwich one afternoon. This has now peaked Rylan's interesting in cooking and now randomly he will say "I Cook. I Cook". When you ask him what he is going to make he may even say "Butter Butter Jelly". Today, my wife says that he, after a bit of "I'm Hungry" (he says this even when he isn't hungry), grabbed her face and and said in a very serious way, "Mommy please, I cook I cook". It looks like it is now time to start hunting down more recipes that he can help with. It is of course very beneficial for a boy to learn how to cook so that he doesn't have to rely on his mother and future girlfriends/wife to cook for him. I really don't want him eating ramen noodles everyday after he moves out. Does anyone have any tasty recipes for a 2.5 year old? Friday night, Rylan and I, made cinnamon/sugar crescent rolls which were pretty tasty. He definitely liked helping with that one. Written on July 18, 2008 by Rylan & Kaitlyn. Well the bug man came out this week to help us with the small bug problem we've started to have. 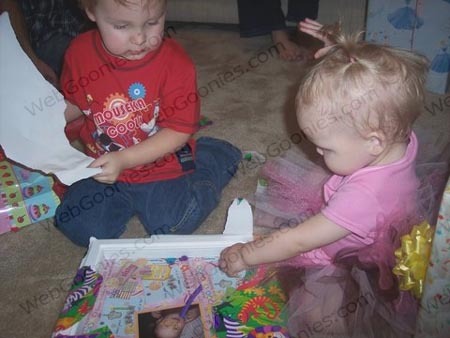 He was a bit of an odd guy but I like showing him Kaitlyn's bubble blower that she got for her birthday. Kaitlyn did not like the guy at all and pretty much cried the entire time he was there. Hopefully those bugs stay away. Speaking of bugs, we were about to head out to run some errands and when my dad opened the door something big ran in. My dad thought it was a big roach so him and mom cleared out the toys that it had run under. It was so fast. When my dad picked up a Doodlebops hat that it was under, he squashed it with a paper towel like a ninja. We all felt really bad because it was a lizard without it's tail, not a roach. That could have been a neat pet to have. We had our pictures taken by a real professional this week which was fun. Kaitlyn and I both did really well in front of the camera. It was a very relaxed session and not a bunch of common shots like we typically do at Sears. Those Sears sessions are always painful and stressful but this one we did the other day was great. The pictures turned out amazing as well. Our dad will get a few of them up next week definitely. It seems like just the other day that we were at the craft show but tomorrow we have another one. Mom and dad of course have been working hard to fill an additional table. This is the first show that Kaitlyn is able to walk so we are going to hang out in the grass this time. We can all walk over to the petting zoo now and maybe even get her a dairy free cookie if they have one. I know that I am looking forward to some of those treats and I think my dad said we would buy some vegetables this time to munch on as well. That's going to wrap it up for now. Have a safe weekend everyone. Written on July 17, 2008 by Kevin. Kaitlyn has really grown to like her hair bows and headbands. She is getting really good about leaving her bows alone and the funniest part is that she tries to put them on herself. She now tells the world just how cute she is by saying "Look it! Look it!" when she is wearing her cute bows. Cute is an understatement. Written on July 15, 2008 by Kevin. We live in a condo so we have neighbors to both sides of us. When the lady next store sold her place we were a bit worried as she was normally super quiet. The new seller however was not so quite. In fact, she began renting the place out to crowds of people that I would have preferred not to see. We managed to 'encourage' the first crowd out of there after a few months but the second set of people stuck around for quite a while. After many complaints, they finally packed up about a month ago. We were thrilled. Life was well as they left. It was quiet at last but they had one last trick up their sleeves. Roaches. It turns out the place was a bit trashed (should have seen that one coming) and they likely had roaches because as they finally left, the rest of the units in our block of condos began seeing roaches as well. We were certainly surprised about our new unwanted guests. We began seeing a single roach from time to time in different parts of the house. We didn't even want to try and take care of this ourselves so we called an exterminator. We wanted to make sure that whatever the exterminator sprayed down would be kid safe. We looked up some organic control methods and finalized on a company called Arizona Organic Pest Control. Their main form of control is with Diatomaceous earth and essential oils. Very safe and very interesting. Our front yard now smells like licorice which is certainly a lot better than your typical strong chemical smell. We are monitoring the situation closely to see how well these things are going to work. Let's hope it is as effective as they say it can be. Written on July 11, 2008 by Rylan & Kaitlyn. Well the most exciting thing this week for both of us was the birthday party. 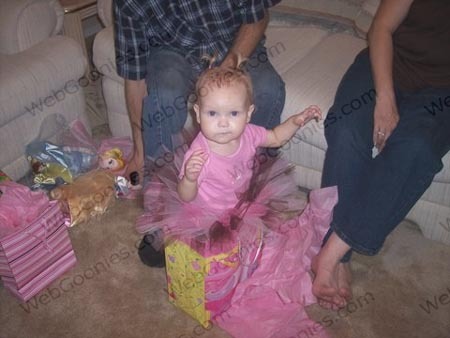 Kaitlyn of course looked super cute in her dress and then in her tutu. We had a lot of fun playing with Hayden. We all received very unique party favors. They are called I Spy bags and you have to find objects in a bag of rice. It's much neater in person than trying to describe it. 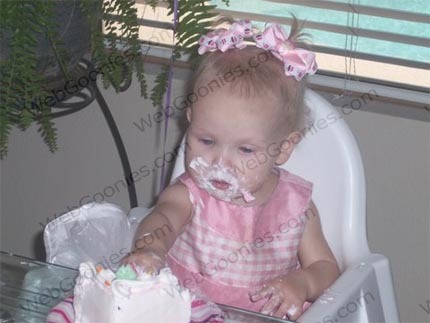 Kaitlyn had a blast eating her cake as you could tell from the pictures. It was a very special day. Speaking of Kaitlyn, she is walking really really well now. She had made a few steps prior to the party but after seeing her cousin Hayden walking, she picked up a few things and hasn't stopped now. It just took a bit of encouragement I figure. She can walk around the room with ease now. It won't be too long before she is running after me I bet. Last night was pretty darn crazy. We went out to eat and had a few errands to run and when we came out of one store, it was pouring rain. I don't think we had ever seen this much rain come down so quickly. Our dad drove us to our next store and by the time we got in, we were soaked. Kaitlyn didn't appreciate being wet but I loved it. We eventually headed home and dad fought the flooded roads. Luckily we have a van which is a bit higher than other cars, like the ones that were stranded. It was so so crazy that I was yelling from the back seat, "Go Kevin Go Kevin!". We eventually ran over a manhole cover that had been moved off its spot. Talk about a loud thud. We made it home safely though which was good. We have our monthly craft show coming up next Saturday so mom and dad are busy again at nights. When Kaitlyn and I go to sleep, they stay up working on bows and other stuff. They are working hard but it's coming along pretty nicely. Someday, Kaitlyn and I will have our own booth setup that features our wonderful artwork. They would certainly be best of show. Written on July 9, 2008 by Kevin. Here is a picture of Kaitlyn with 2 of her new toys that she received from her birthday. Yes, she is a firm believer in the attached parenting techniques so she proudly shows off her new sling for her cabbage patch kid. Her baby even included a bottle which she feeds to the her, amongst the whacking on her head. I can definitely see these becoming some of her favorite toys. Written on July 8, 2008 by Kevin. This year we were lucky to find a few neat toys for Kaitlyn other than your typical stuff. The craft shows and expos we have been at recently have allowed us to find some unique gifts that she is sure to love. Those pictures will come tomorrow but in the meanwhile, here are a few pictures of her during the gift opening part of the day. 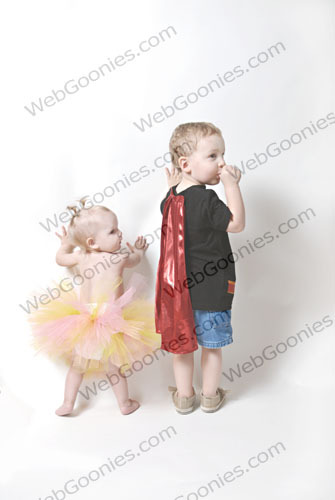 She made an outfit change into one of her tutus and certainly looked pretty as one of the gifts. She had fun opening each of the gifts and posing for pictures. Written on July 7, 2008 by Kevin. 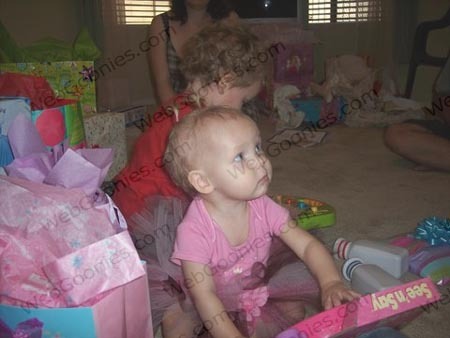 Kaitlyn had a wonderful birthday party on Saturday and as you can tell from the pictures she was quite happy. Today is her actual birthday and I was a bit bummed not to be able to stay home from work to celebrate it with her but she surprised us by waking up at 12:30am this morning and we got to wish her a Happy Birthday before anyone else. She is definitely a very special girl. Written on July 1, 2008 by Kevin. It really is fun to see Rylan and Kaitlyn find joy in the smallest things. Our nightly routine now includes the kids turning off the light when they go to bed. Rylan's job is to turn on their soother while they switch between pulling the light off by the fan string. They both find this to be the most fun thing ever. Kaitlyn tries to grab at the string while it moves around and all that she can do is giggle. Rylan purposely misses so that Kaitlyn can laugh and he can drag on the night a bit longer.